Since our first visit to Kauai last year, I have been raving about the place to anyone who will listen! 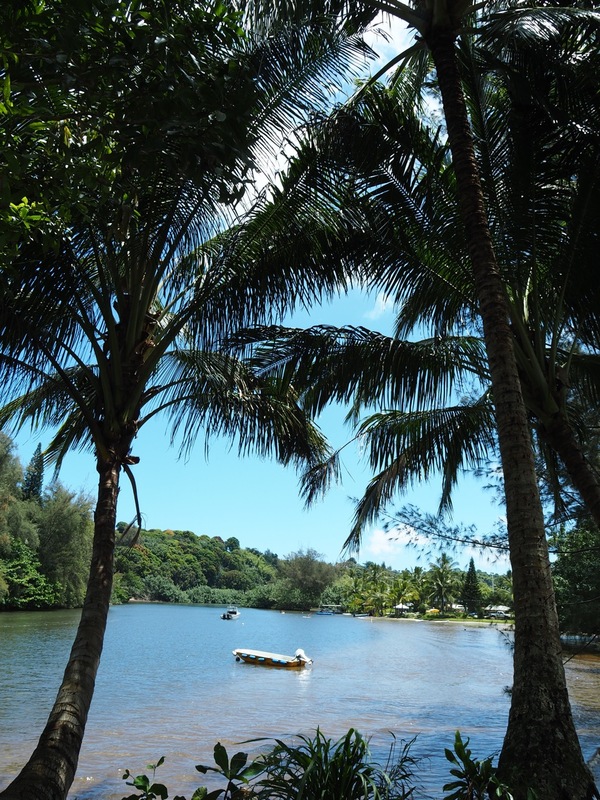 From the moment we caught sight of the island and witnessed Kauai’s natural beauty, we knew that it was a really special place. Every minute we spent on the island made us fall in love with it even more. It was incredibly sad to leave and all I could think of in the following months was how much I wished I was still there. While we had only spent five days on Kauai (far from enough), I could already see myself returning over and over. So I did something which I don’t normally do; I booked a return trip to Kauai for this year! In April we took our second trip to what remains our favourite island in the world. This time we decided to stay eight days. Needless to say, we had the same smile on our faces as we landed on the island, and that smile lasted for our entire visit. The Nā Pali Coast is a state park covering 6,175 acres, found on the North West side of Kauai. 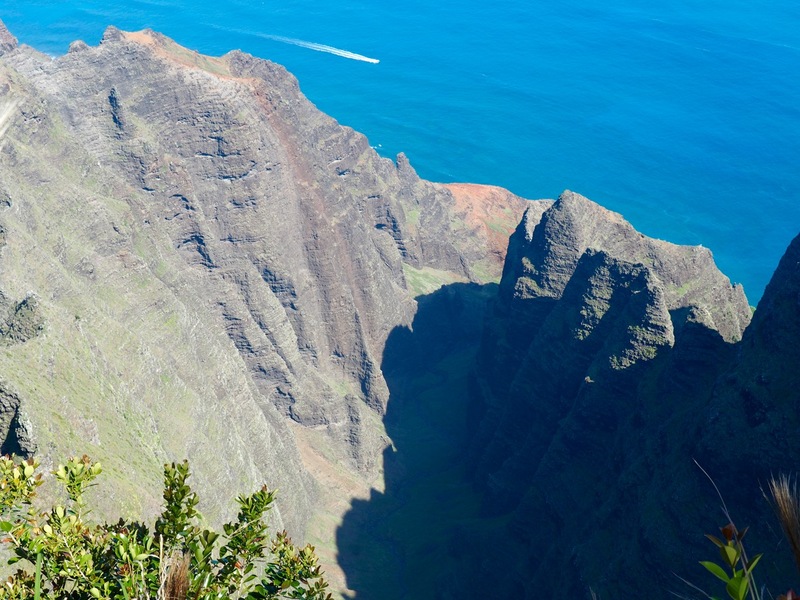 With its fifteen-mile stretch of rugged coastline and its cliffs (called Nā Pali in Hawaiian) soaring as high as two thousand feet, it is truly a sight to behold. It is a true wonder of this world as anyone who has had experienced it will tell you. 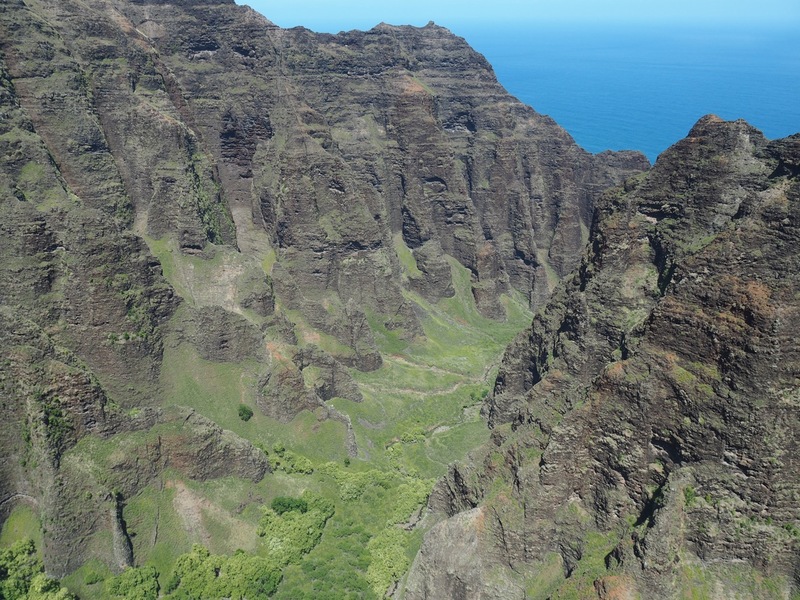 Most of the Nā Pali Coast is inaccessible by land and there are only three ways to explore it (read about them here). No matter which way you choose you will be in awe of the breathtaking views. To date, I haven’t seen anywhere else on this planet quite like it. 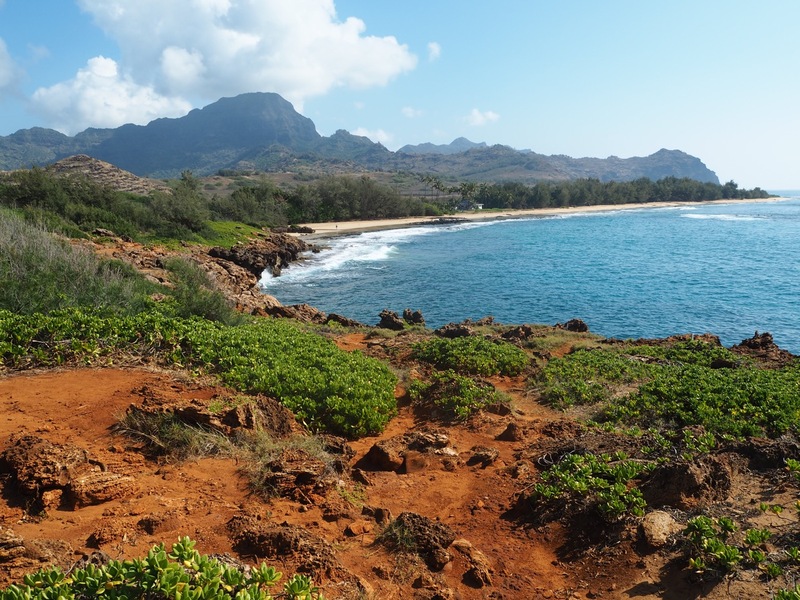 It is by far the best place to visit on Kauai, so you really should take a full day or two to explore it. 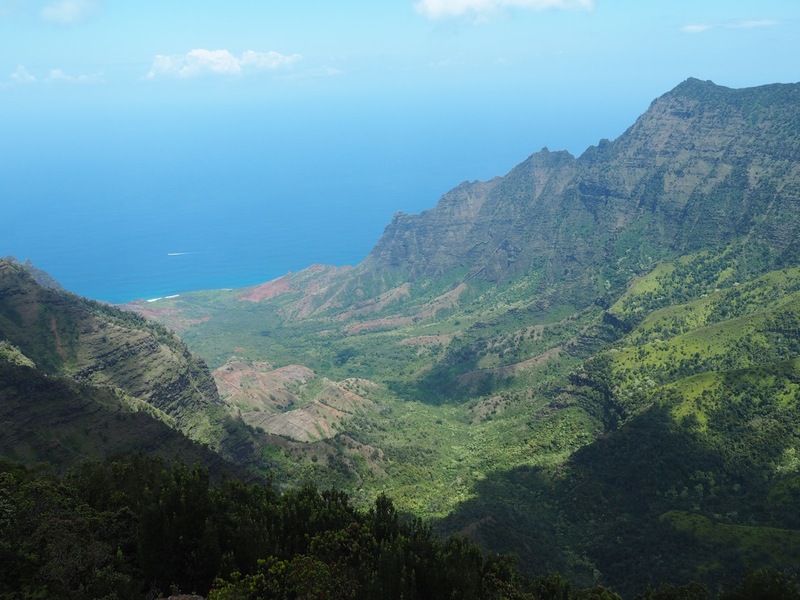 We strongly recommend taking more than a day to explore the Nā Pali Coast. Click here to find accomodation on the Nā Pali Coast. Any booking you make helps support this site, but won’t cost you any extra. 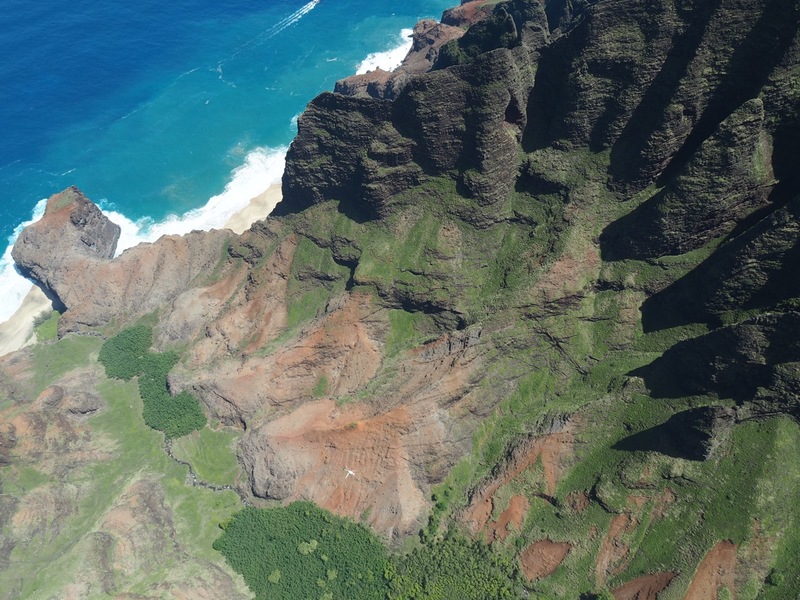 A view over the Nā Pali Coast from the air. 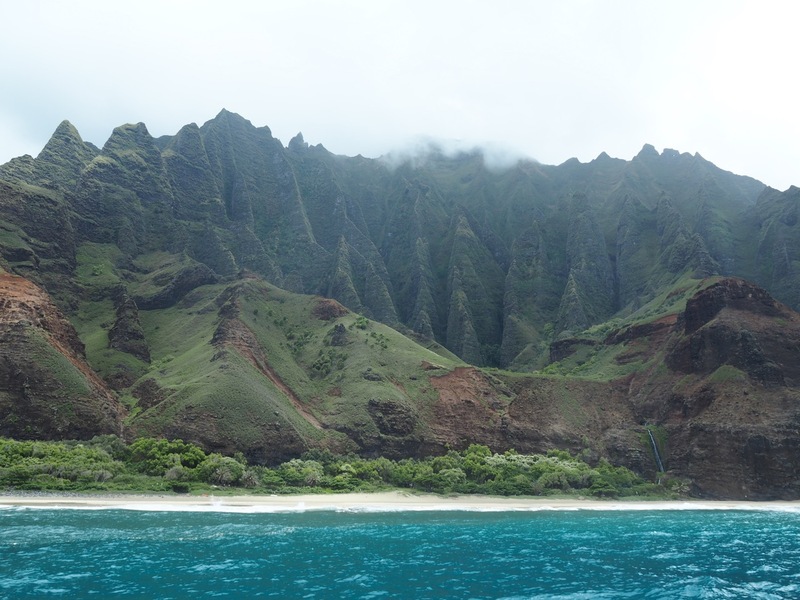 A view of the Nā Pali Coast from the sea. Also nicknamed the “Grand Canyon of the Pacific”, the ten miles long Waimea Canyon sort of feels out of place on this small tropical Pacific Island! You should allow at least a half day to visit the canyon, and if you have time go on the Canyon Trail Hike. This four-mile return hike heads down the canyon to the overlook above Waipoo Falls. If long hikes aren’t your thing don’t worry; there are many shorter hikes to do and some great lookout points. 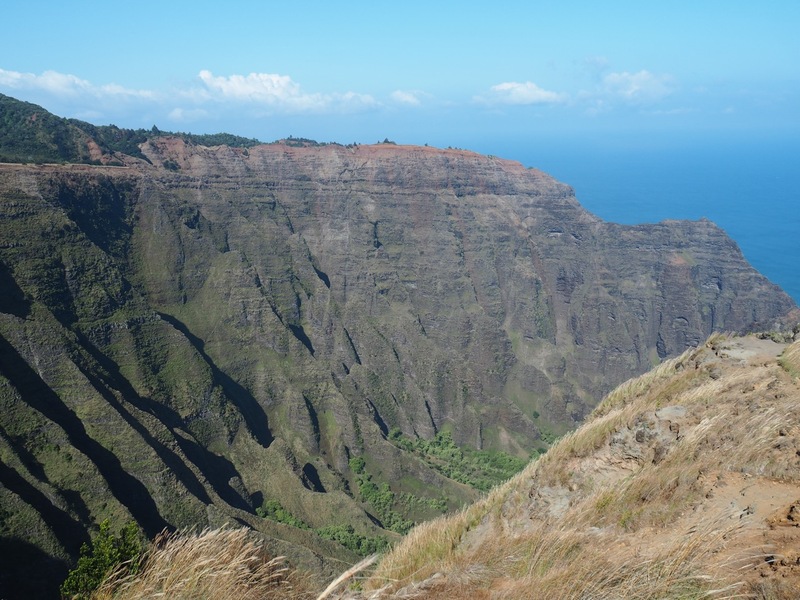 The Waimea Canyon Lookout and Puu Hinahina Lookout both provide the best views of the canyon. A view over the canyon from the air, complete with waterfall. Another view over the canyon from the air. The weather up there can be terrible. We had rain both times we were there. So be prepared, take your wet weather gear, and expect to get wet! Make sure you fill up with petrol at Waimea before driving up Highway 550 to the canyon as there aren’t any petrol stations up there. Take a picnic and enjoy it with a nice view! The view from the Waimea Canyon Lookout. 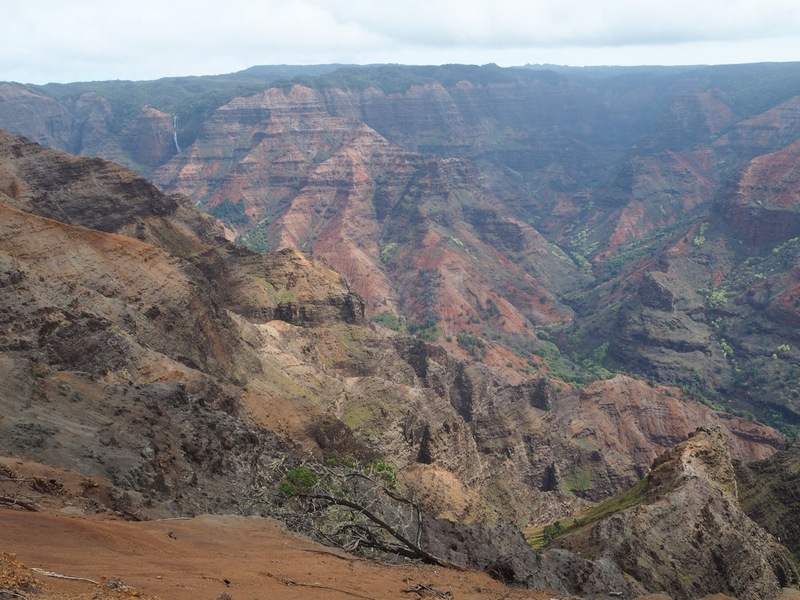 After exploring Waimea Canyon, keep driving up Highway 550 to Koke’e State Park. 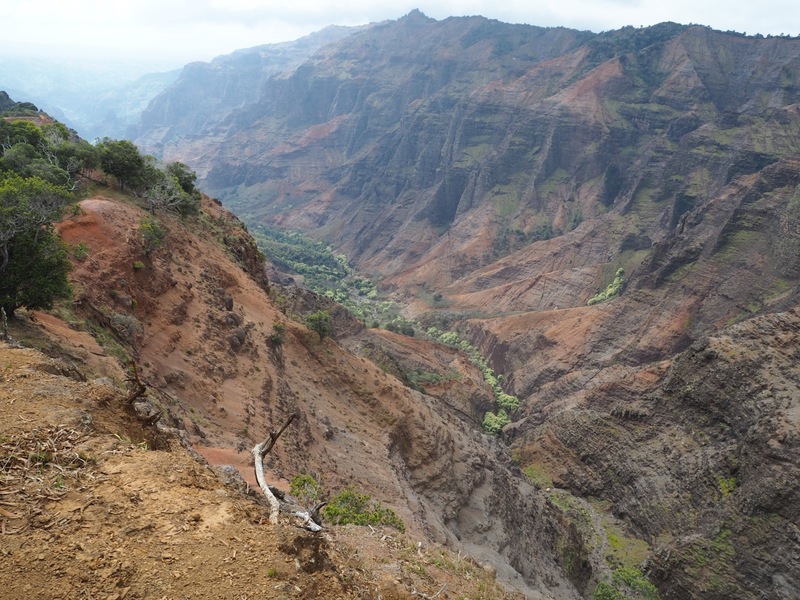 Koke’e State Park offers forty-five miles of hiking trails and some dramatic views over the towering cliffs of the Nā Pali Coast. 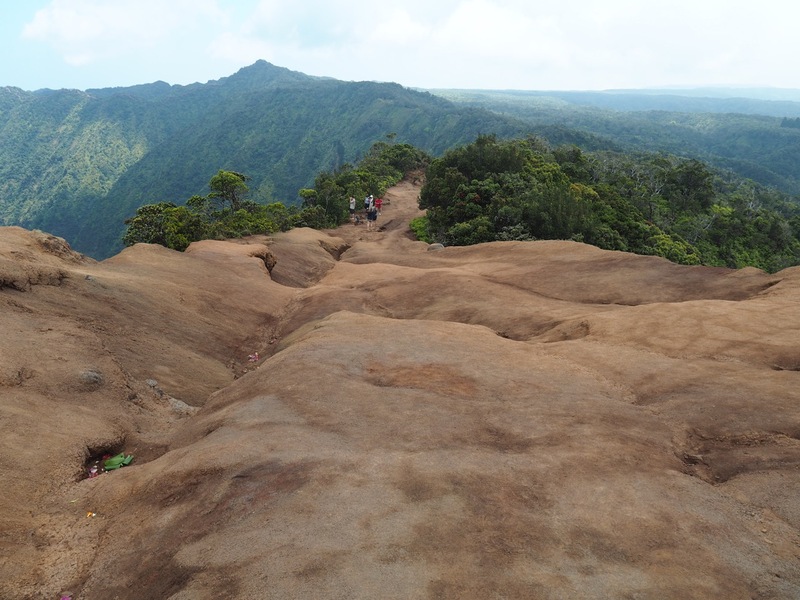 If you are short on time or are not a hiker, stop at both the Kalalau and Puu O Kila lookouts for some outstanding views of the Kalalau Valley stretching out all the way to the ocean. The Pu’u O Kila Lookout. The spectacular view from the Pu’u O Kila Lookout. If you like hiking try one of the many hikes. There are some for every experience level. We chose the Awaawapuhi Trail which took us down 1620 feet through a rain forest to the rim of the Nualolo and Awa’awapuhi valleys. It wasn’t a short hike (6.5 miles return) and it was very steep climbing back up, but the views over the valleys made it totally worth the effort. The view at the end of the Awa’awapuhi Trail. Worth the effort! Tip: If you arrive at any of the lookouts and find your view blocked by fog, don’t turn back. The fog often clears very quickly on this side of the island and if you wait five to ten minutes you will probably get a nice blue sky! 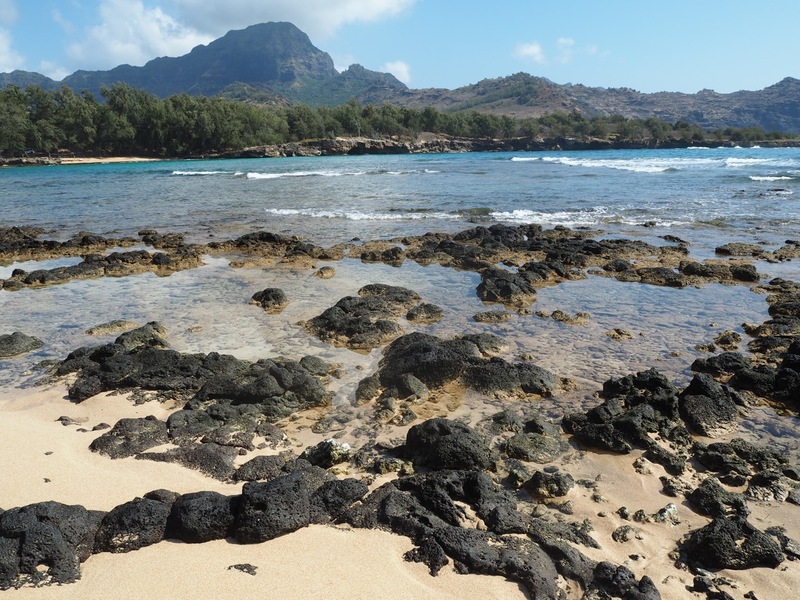 Poipu beach is on Kauai’s sunny south shore and is one of its nicest beaches. Whether you are into snorkelling, swimming, boogie boarding, surfing or simply working on your tan, Poipu is perfect for everyone. And the best part is that it’s brilliant all year round, unlike the north shore beaches which are way too rough for swimming or snorkelling in winter. 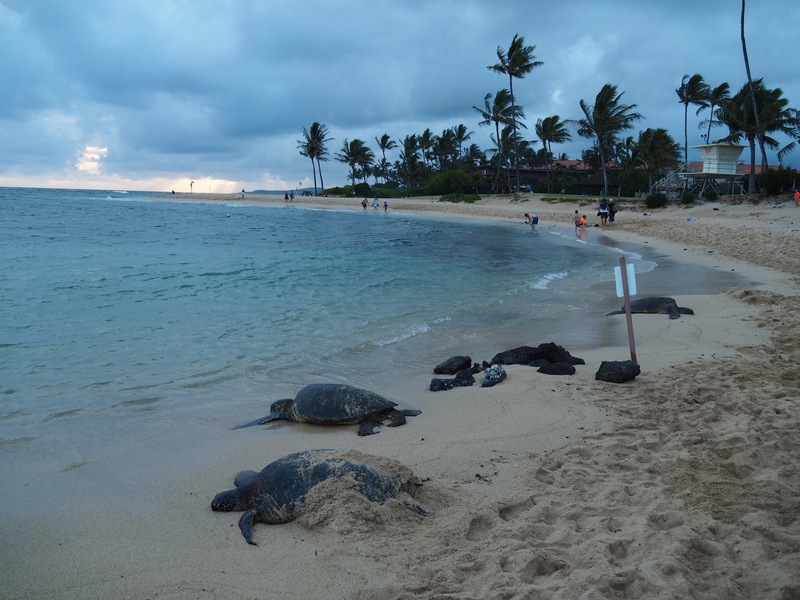 Don’t forget to visit Poipu as the sun goes down for your chance to see not only a spectacular sunset but you may also spot some turtles resting on the beach. 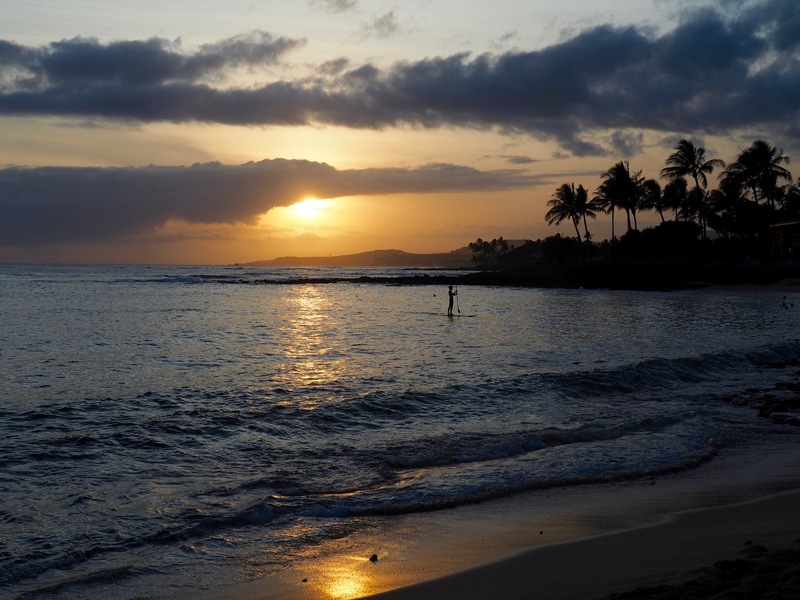 A beautiful sunset on Poipu beach. 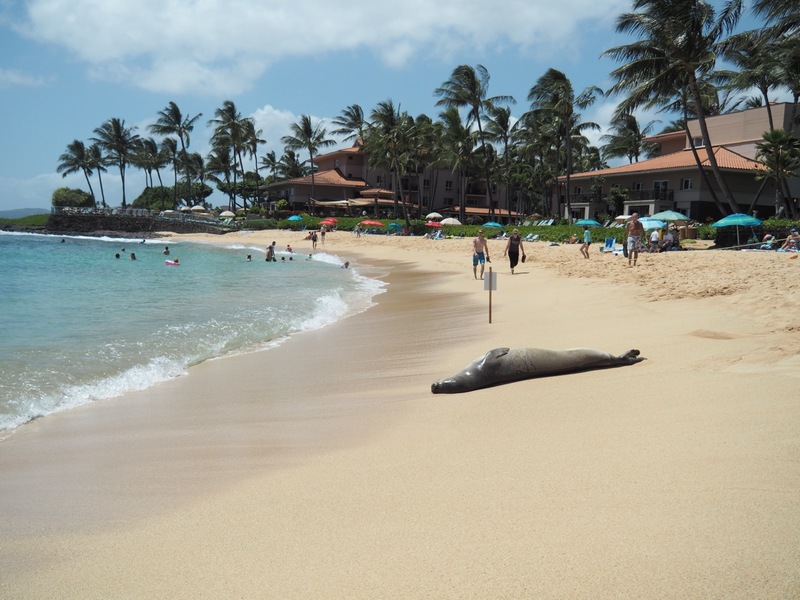 An endangered Monk Seal resting on Poipu beach. 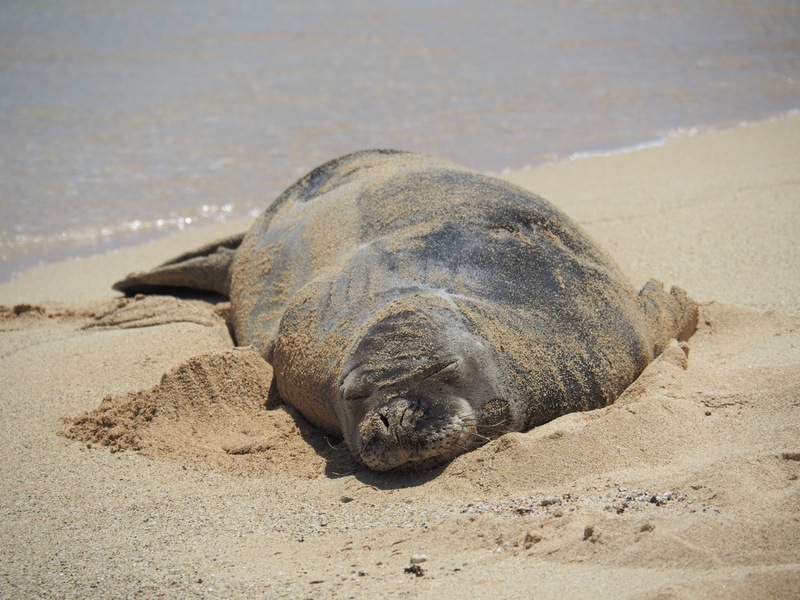 Tip: Endangered Monk Seals are often seen resting on Poipu Beach. Please give them some space and do not disturb them. Follow the guidance of the beach volunteers that look out for them. They may look cute but they can become aggressive if disturbed. 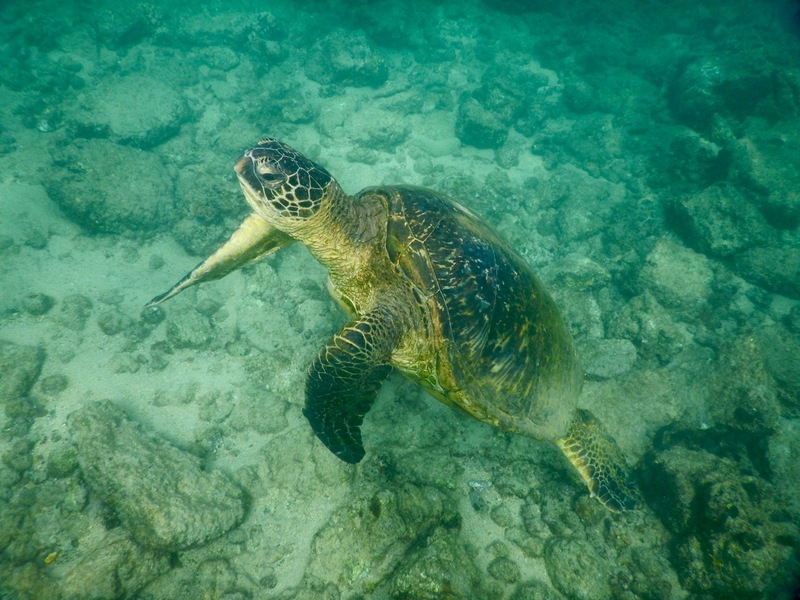 If you are lucky you might even see one swimming past as you snorkel off the beach. We did on our first trip and it was incredible! A few turtles resting on Poipu beach at sunset. 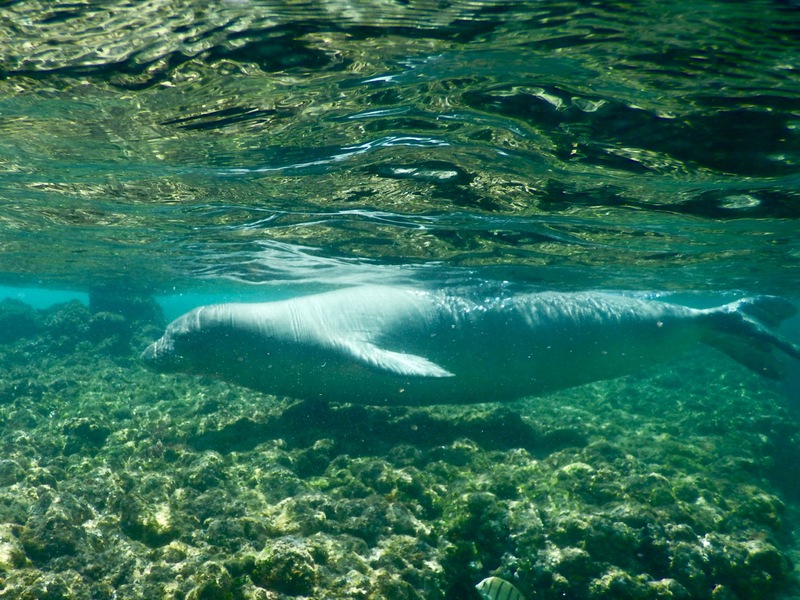 An endangered Monk Seal swimming past us on Poipu Beach. It’s a hard day for some! 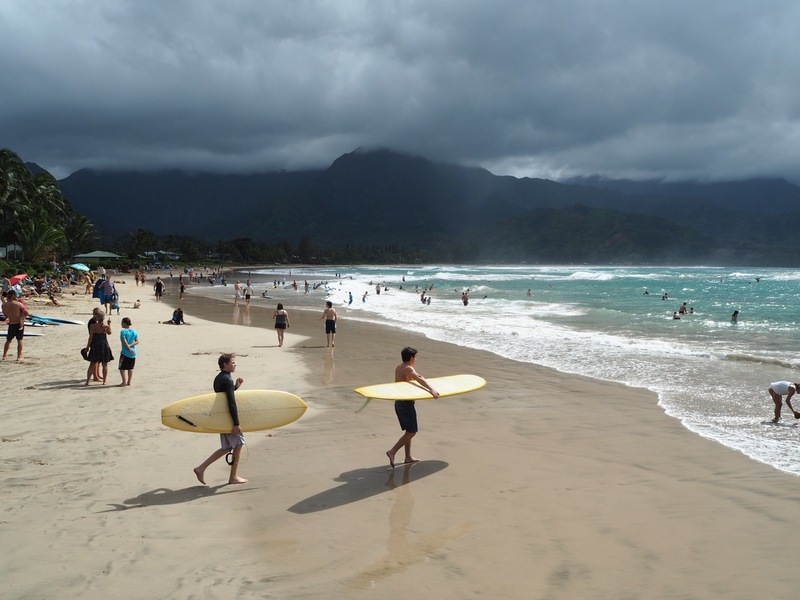 Hanalei Bay is the most popular swimming beach on the north shore. 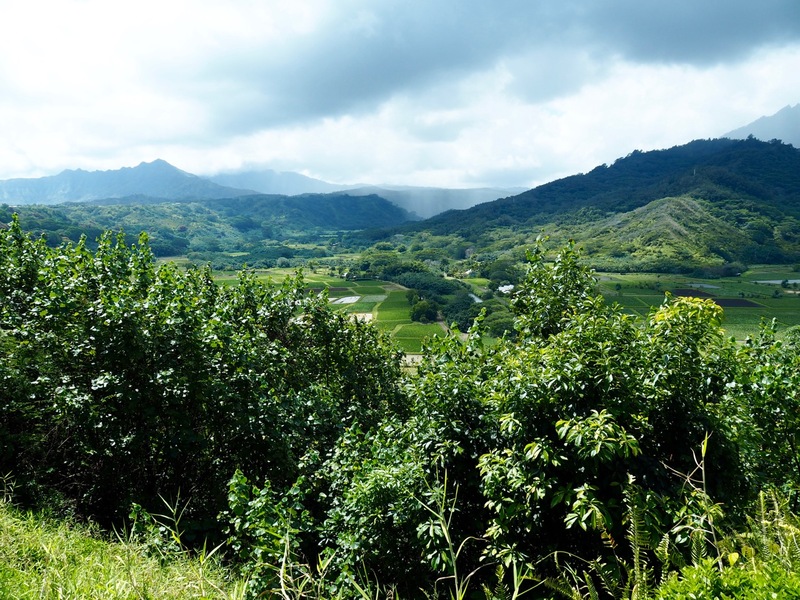 It has the striking green hills of the north shore on one side and the Hanalei River on the other. It is a very popular beach, loved by tourists and locals alike; so if you arrive late on a weekend or in high season you might struggle to find a parking space! Surfers, swimmers, paddle boarders, kayakers all come to enjoy this two miles long stretch of sand. 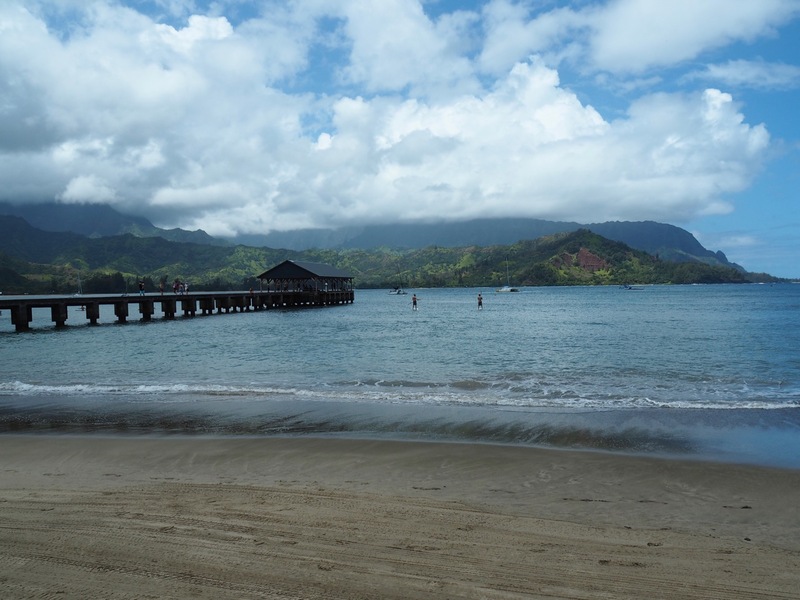 Unlike many of the beaches on the north shore, Hanalei can be enjoyed at any time of the year. Hanalei Bay a popular North Shore hangout. Tip: Visit after heavy rainfall to see lots of waterfalls flowing down the surrounding mountains! That’s not a sight that you see every day! 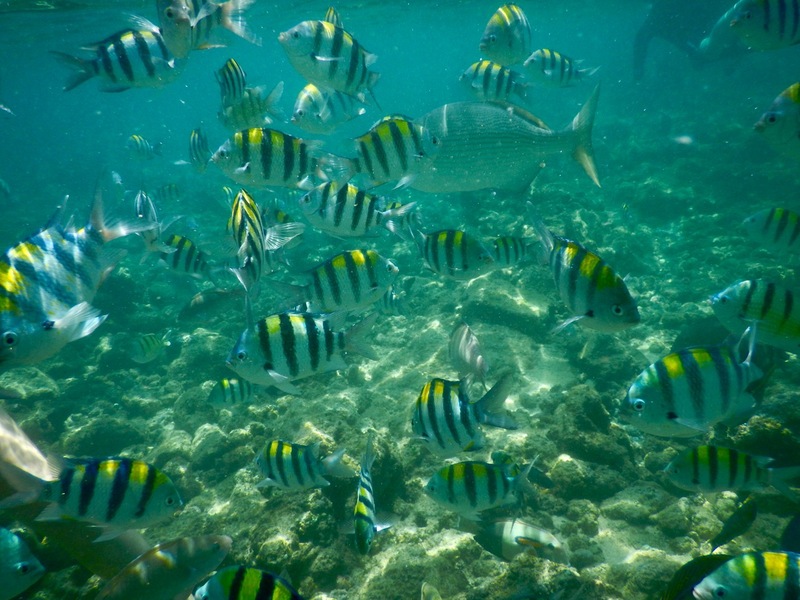 Like many islands in Hawaii, Kauai offers fantastic snorkelling. The time of year does affect which parts of the island are suitable for snorkelling, however. 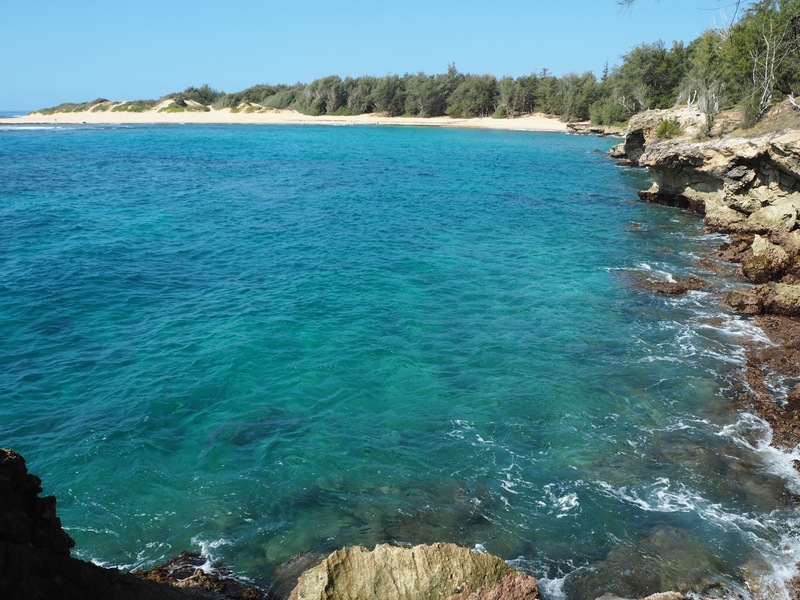 The north shore beaches are just too rough for snorkelling in winter, but if you visit in summer you’ll have more snorkelling spots available around the island than you can manage in just a few days. We’ve always visited in spring so we can’t give much insight into the north shore snorkelling, but the south shore truly offers some amazing snorkelling. 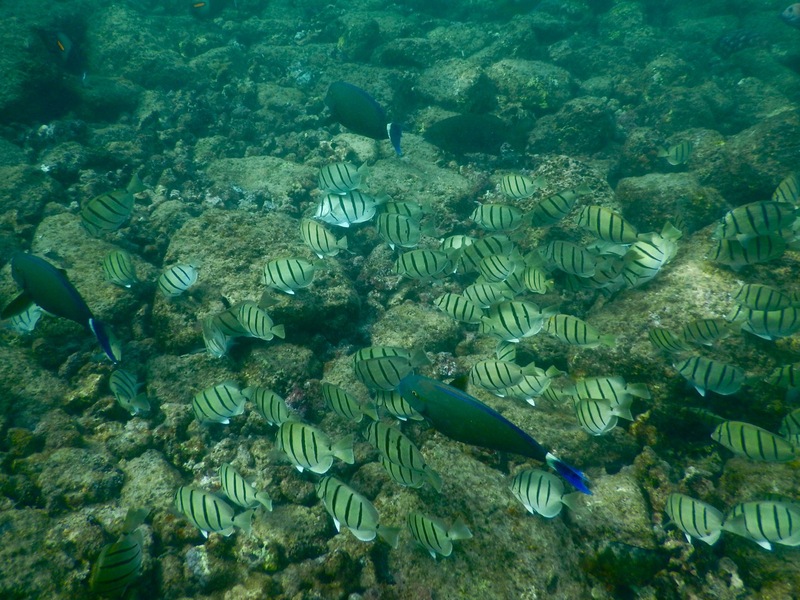 Our favourite snorkelling spots in Kauai so far are Poipu Beach Park, Lawai Beach, and Koloa Landing. 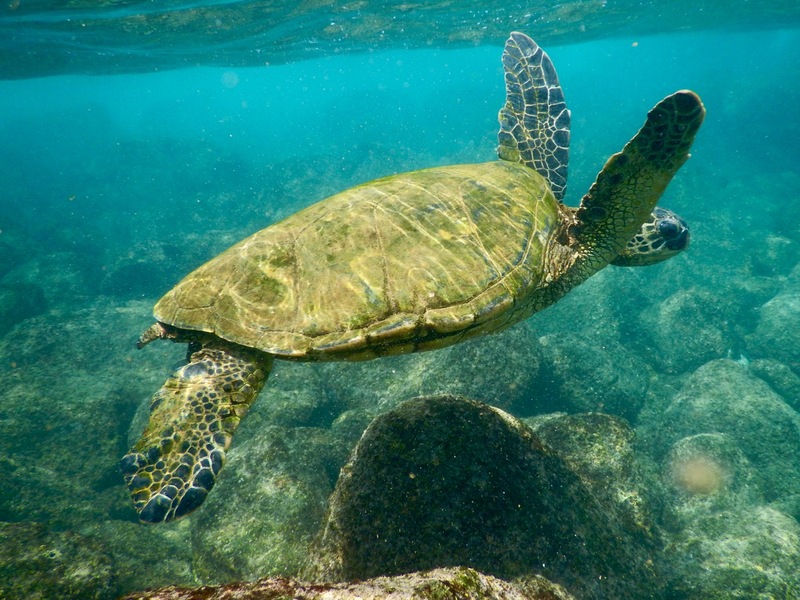 For spotting sea turtles there is no place like the Nu`alolo Kai Reef, which is off the Nā Pali Coast and only accessible by boat. 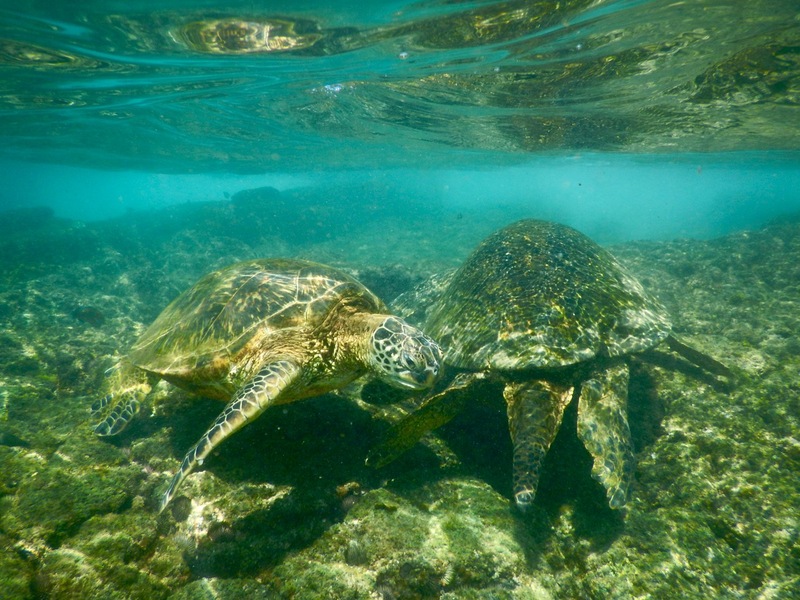 Snorkelling with turtles at Lawai Beach. A school of Convict Tang. A turtle at Koloa Landing. Amazing snorkelling on Poipu Beach. 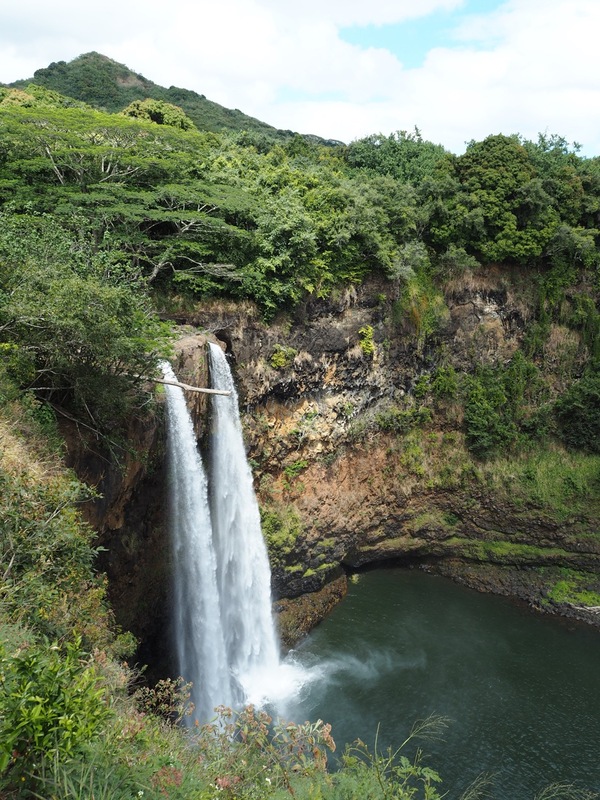 Wailua Falls should be your first stop on the island as they are a mere ten-minute drive from the airport. These eighty-three feet high falls are the easiest waterfalls to access in Kauai. There’s no need to hike for miles to catch a sight of them. You just drive there! If you are old enough you may remember them from the start of the hit 70’s TV show “Fantasy Island”. You can’t get down to the waterfalls or swim beneath them, so this is just a quick photo stop. Tip: Parking spots are scarce and the falls are extremely popular, so you might have to wait to park. You shouldn’t have to wait too long however as parking is limited to twenty minutes. 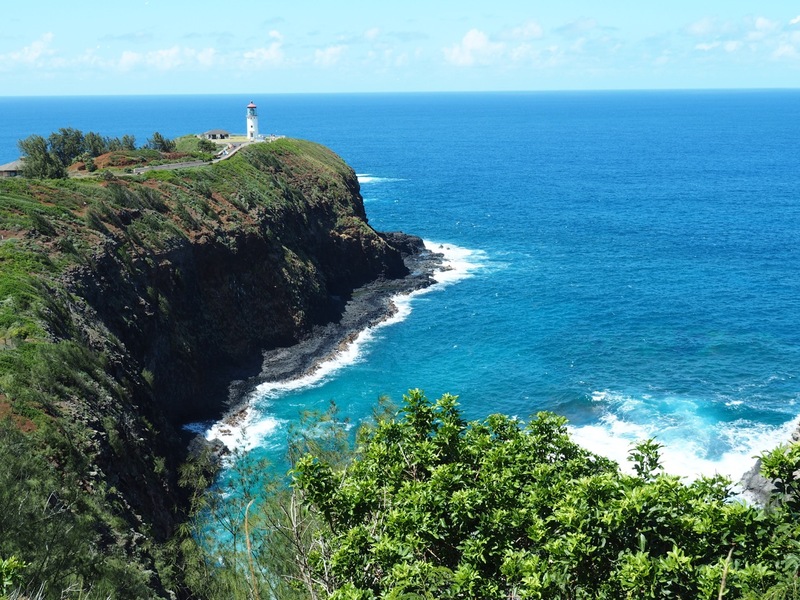 The Kilauea Point National Wildlife Refuge and Lighthouse is found on the north shore of Kauai. It’s a great place for viewing birdlife and some magnificent coastal vistas. 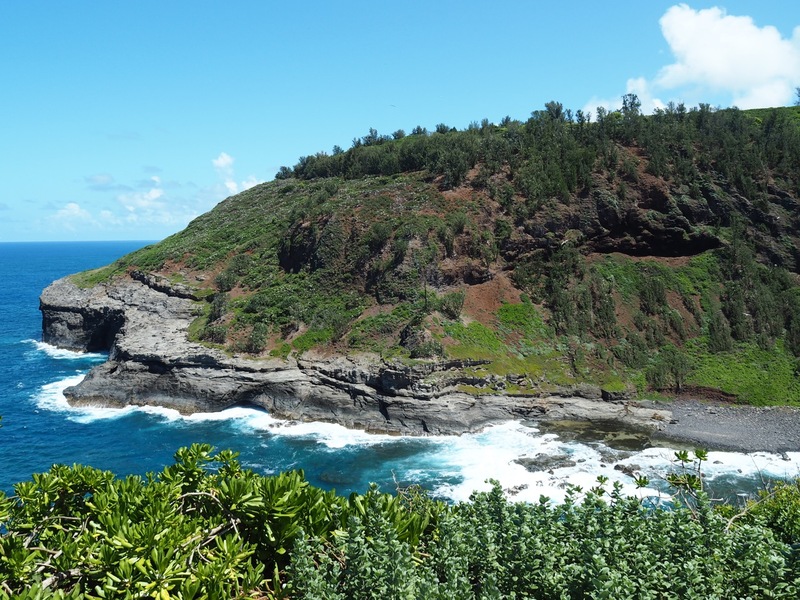 The steep cliffs surrounding the refuge are one of the best places in Hawaii to view wildlife and are home to the biggest population of nesting seabirds in the state. Seeing the Albatross flying over us was really impressive. If you look closely you may also spot pods of dolphins swimming along the shoreline. During whale season keep your eyes peeled for whales! Nēnē (endangered Hawaiian geese) also roam the area around the refuge, so look out for then when driving. They aren’t very street smart! The view from the Kilauea lighthouse. Tip: The cost to enter the refuge is $5 and it’s open Tuesday to Saturday from 10:00 am to 4:00 pm. If you arrive outside of those hours you can still see the lighthouse and the coastline from the lookout point. 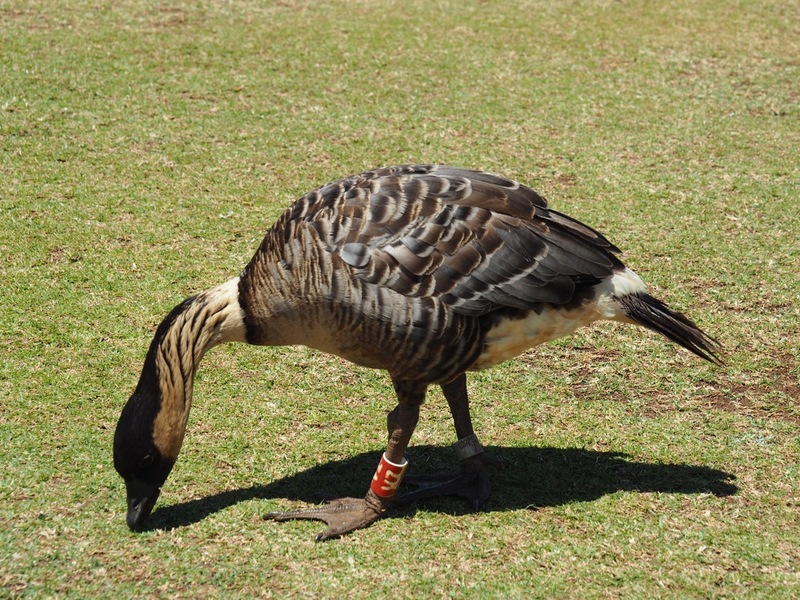 A Nēnē (endangered Hawaiian goose). 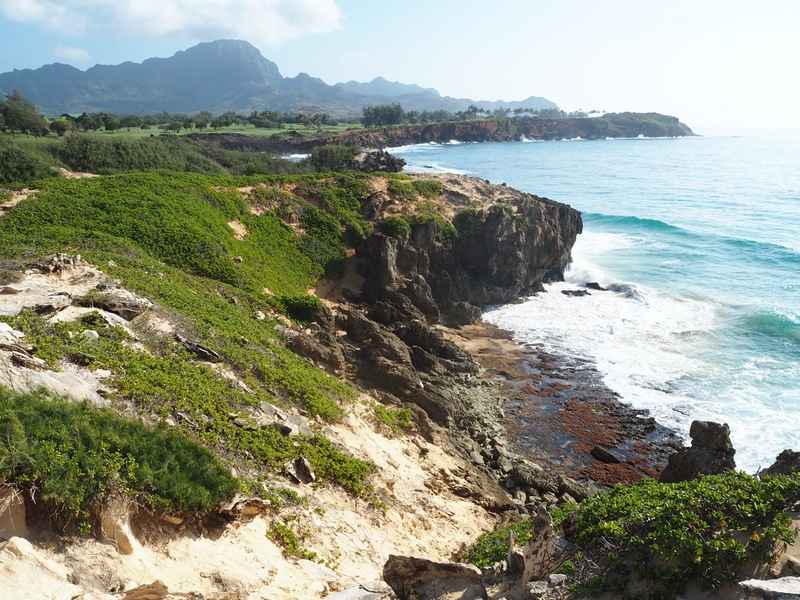 This four-mile return hike begins from Shipwreck Beach behind the Hyatt Hotel in Poipu and ends at Keoneloa Bay. It’s a very easy coastal walk along cliff tops, through sand dunes, past historic sites, a golf course, a cave and beautiful deserted beaches. This hike offers some really good photo opportunities of the stunning coastal scenery. Once again keep your eyes peeled for whales during whale season; you may see them breaching as you walk along the clifftops. Stunning blue water on the Mahaulepu heritage trail. This is a quick stop while on the Poipu side of the island and it’s easily accessible, free and suitable for all ages. 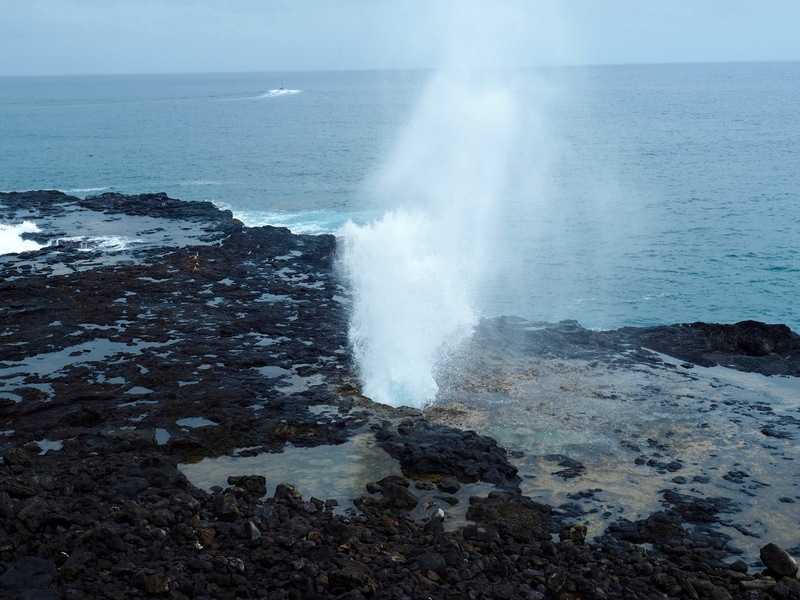 Incoming waves hit the rocks below the cliffs and the water is forced up through lava tubes, producing a large spray of water. Water is propelled about ten feet into the air, multiple times every minute. It’s quite fun to try and guess when the next spray will happen and it’s also a great photo opportunity! 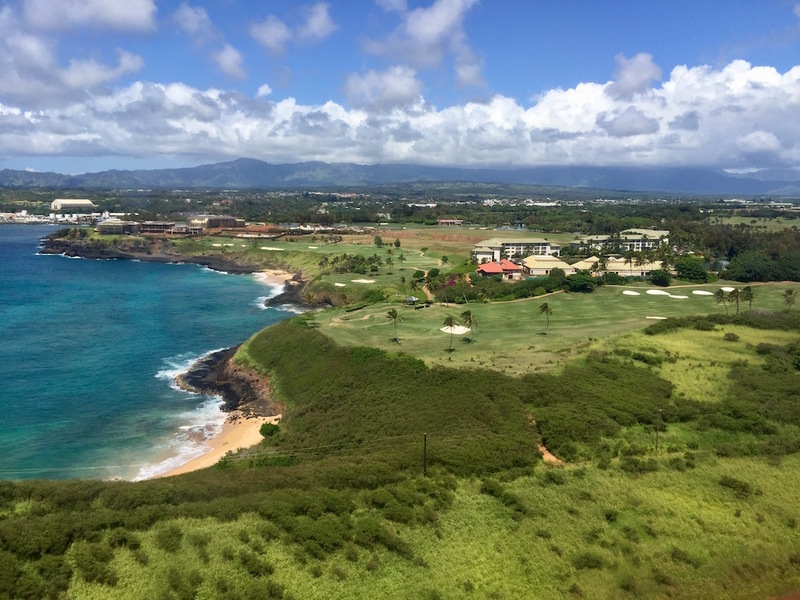 11 – Looking out for Kauai’s birdlife! 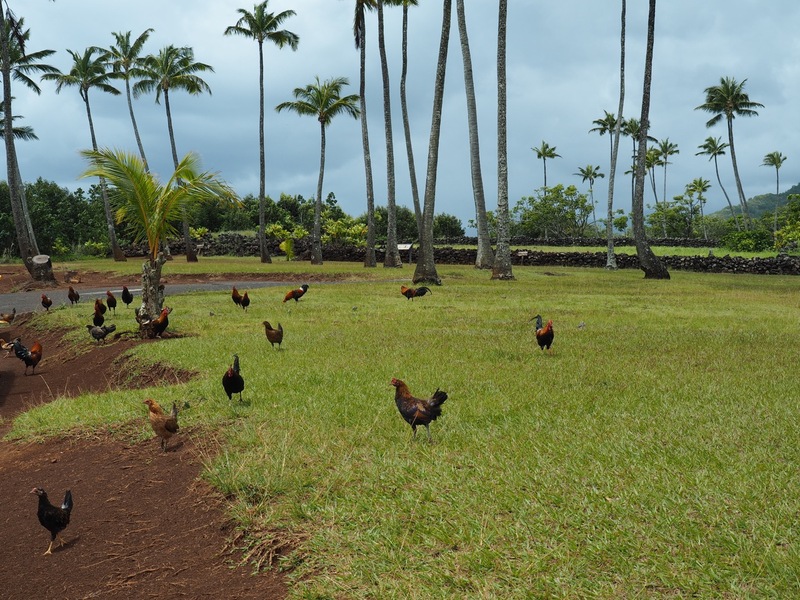 Kauai is home to a lot of birdlife. It’s also a rooster and chicken’s paradise. They are everywhere, grazing around your condo, strolling in carparks or at the beach; even inside the airport! Everywhere! I loved seeing all the baby chicks running around! You don’t need to bring an alarm clock with you to Kauai. The roosters will make sure you get up on time every morning! Sometimes as early as 4 am! It’s not a sound we get to wake up to back home in our big cities! 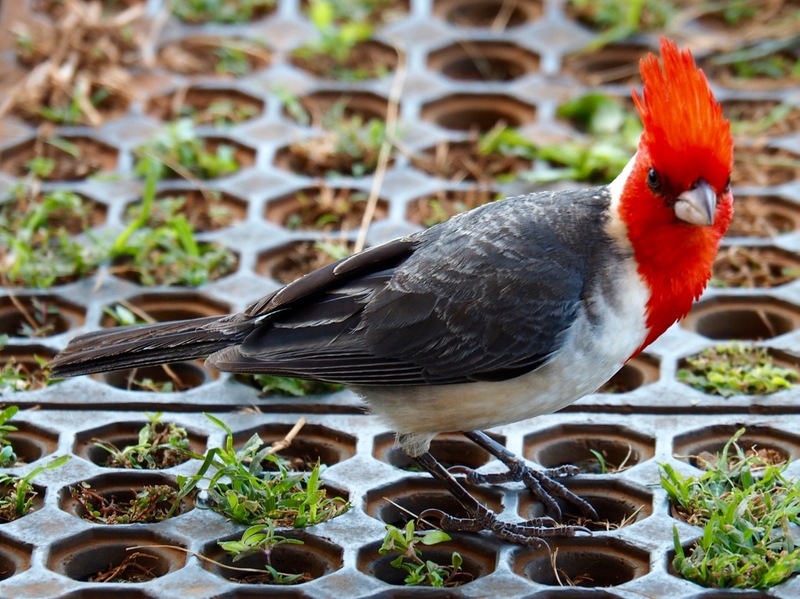 A Red-crested cardinal, one of the many bird species in Kauai. 12- Go rum tasting at the Kilohana Plantation! 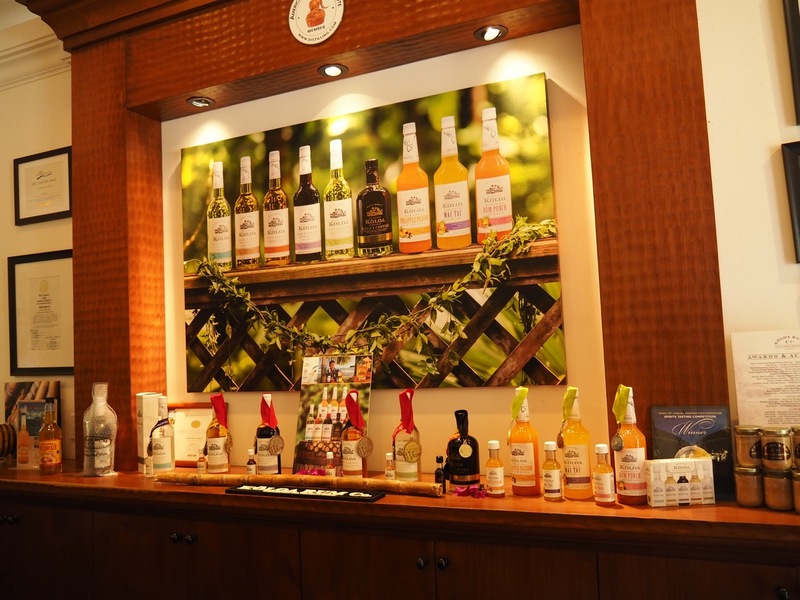 If you like rum, head to the Kilohana Plantation for some rum tasting. It’s free and the rums are all delicious. They run tasting sessions every half an hour and it even includes a demonstration on how to make a Mai Tai! My favourite was the coconut rum, so delicious! Rum tasting at the Kōloa Rum Company. You can combine your tasting with a train ride of the plantation and a lovely lunch at Gaylord’s restaurant set in the courtyard of the historic plantation’s main residence. This restaurant offers a relaxed setting for a long lazy lunch, with views of Mt. Waialeale in the distance and beautiful garden surroundings. So those are our favourite things to do on the island. Have you been to Kauai? If so, what are your favourite things to do? And did you fall in love with it as much as we did? To find out about the best things to do on the Big Island click here. We didn’t get to do 3, 4, 6 and 9 but we did a helicopter tour and the northernmost tip! The helicopter ride is amazing isn’t it? The scenery is incredible especially the Na Pali Coast. We got married on Maui, though got told that Kauai is the island we should visit next, because we love nature and the outdoors, and really revel in getting off the beaten path and into the wilds away from society. I’ve seen such stunning photos of the Nā Pali Coast – I think I have to buy a drone before I travel, would get some great shots! Yes Kauai is the place to go if that’s what you like to do, so many great hikes and some incredible scenery. It’s not as busy as Maui and Oahu too which is nice. We almost got a drone before our last trip to Kauai but a lot of the places forbid drones so we probably wouldn’t have used it much anyway. We saw the island from an helicopter ride and that was fantastic. Highly recommended. Thank you so much. Glad you enjoyed the helicopter ride too. It’s incredible isn’t it? 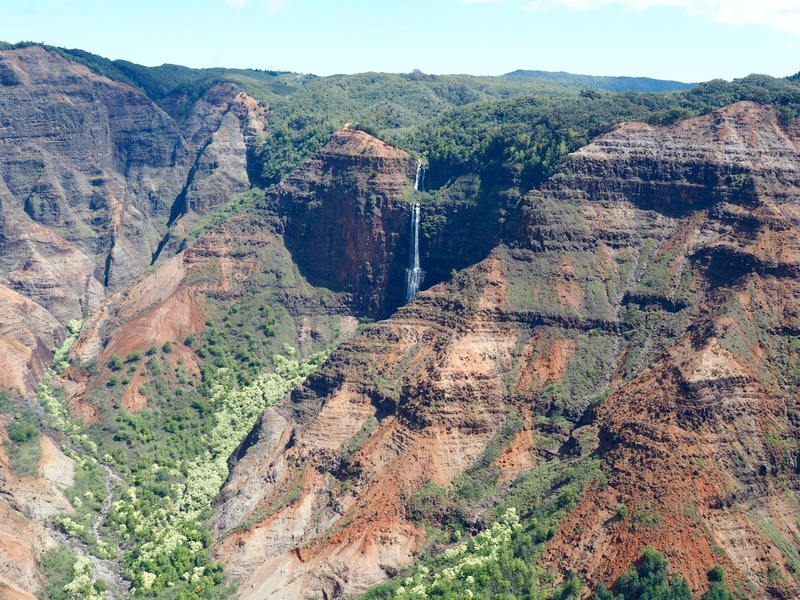 The Canyon is on Kauai which is one of the islands of the Hawaiian Archipelago. 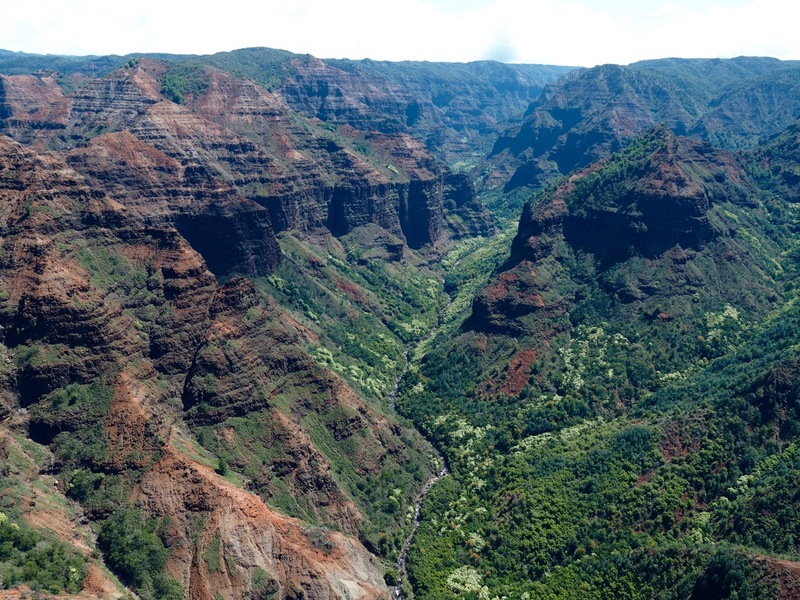 There is also an island called Hawaii also called “the Big Island” but the canyon is on Kauai. Just clarifying in case you wanted to visit. When I read one of your other posts about choosing a Hawaiian Island I picked Kauai as one of the ones I’d most like to visit – now I KNOW that was the right choice! I’d much rather explore natural attractions – the cliffs, waterfall, canyon and birds would be first on my list – but it’s also nice to visit a place with a good variety of things to do. Looking forward to checking it out for myself one day!